Looking at the recipes, the most important criterion is whether the combination of ingredients looks promising enough to produce a tasty dish (another criterion is whether the boyfriend will eat it, but that is a can of worms I will not open at this point). But very often, and I think for many people, an important criterion is whether the ratio of effort and the tastiness of the resulting dish is favourable. For example, one dish with a very favourable ratio is some variant of “minestrone.” In my rendition, it consists of throwing together some vegetables and perhaps a bit of smoked bacon; add some pasta or potato, finish off with parsley and a drizzle of olive oil… For winter, I cannot think of an easier, yet more satisfying dish to make, and this is why I go back to it over and over again. An example of a dish that has a very unfavourable ratio is a mushroom soup from the modernist cuisine cookbook. I have never spent 2 hours pampering a dish, only to end up with foul tasting goo. A book which is so wonderful in its innovativeness and pushing the boundaries, and yet one of the few recipes I choose to cook from it produces food that is as bad as cooked food can be. Granted, I might not have executed all the <insert large number here> steps properly, but it is certain that I will not attempt this again. Even if I get something that is actually edible, it is not worth it. Now, from time to time, I come across a recipe that is both laborious to execute and produces a result which I can be proud of. Inevitably, this will be a recipe for cake. After all, I am a baker at heart. 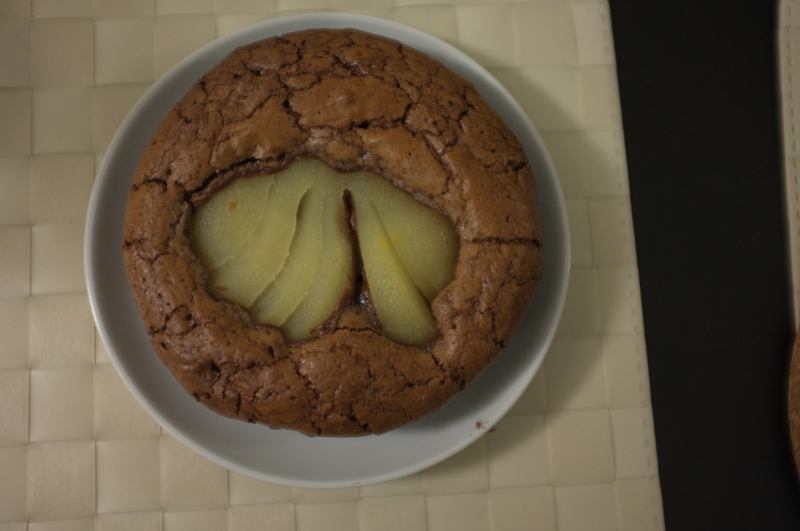 Introduce the pear chocolate cake. I found this recipe at a fabulous blog, and I modified it only slightly: first, I used canned pears; second, for the cake in the photo, I omitted the hazelnuts, but that is only because I did not have any. The original recipe produces enough pastry for a long rectangular tin and at least two more 10 cm tarts. And note to self: rolling shortcrust pastry between two sheets of baking paper is the best thing since sliced bread. For the pastry, place the flour, cocoa, butter and sugar in a mixer and blitz until you get crumbs. Add the egg and mix again. (I needed to add a tablespoon of cold water at this stage).Take the dough out of the mixer and bring together into a ball. Put the dough on a lightly floured surface then roll with a rolling pin until 3-4mm thick. 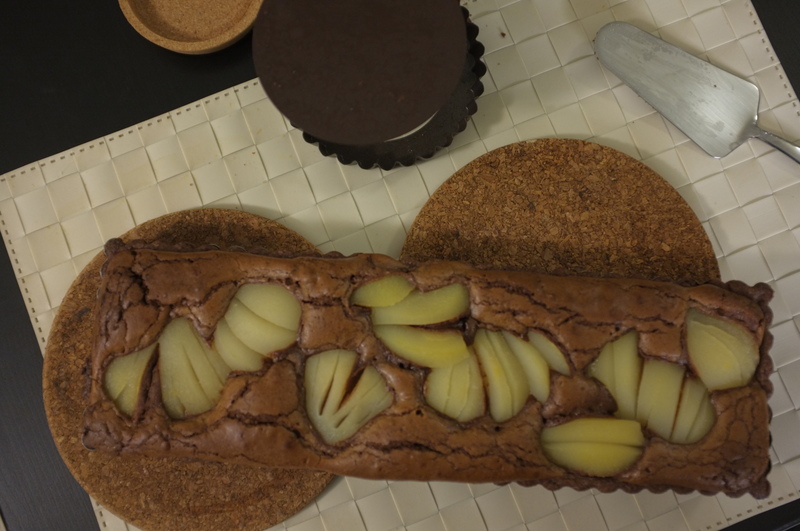 Line the tart tin with the chocolate shortcrust pastry and trim the excess dough neatly around the edges. Refrigerate while you make the filling. For the sponge dough, put the butter and sugar in a mixing bowl and mix with an electric whisk to combine. Mix in the egg and baking powder with the whisk, then gently fold in the flour by hand until evenly combined. To make the chocolate and hazelnut cream, put the chocolate in a mixing bowl. Put the cream in a saucepan and gently bring to a boil over low heat, stirring frequently. Pour into the mixing bowl and whisk until you get a smooth cream, then stir in the hazelnuts. Gently fold the sponge dough into the chocolate mixture and mix well. Remove the tart shell from the fridge and pour in the chocolate and hazelnut cream. Cut the pear into about 6 slim wedges and arrange in a circle on the top of the tart filling. Sprinkle the hazelnuts over the top. Bake in the preheated oven for about 25 minutes. To check if it’s ready, insert a skewer into the centre of the tart – if it comes out clean you can take it out of the oven, if not, leave it in the oven for a few more minutes. Put the apricot jam, if using, in a small saucepan and heat gently until melted and runny. Brush the jam roughly over the tart (avoiding the hazelnuts) with a pastry brush and leave for a few minutes before serving.